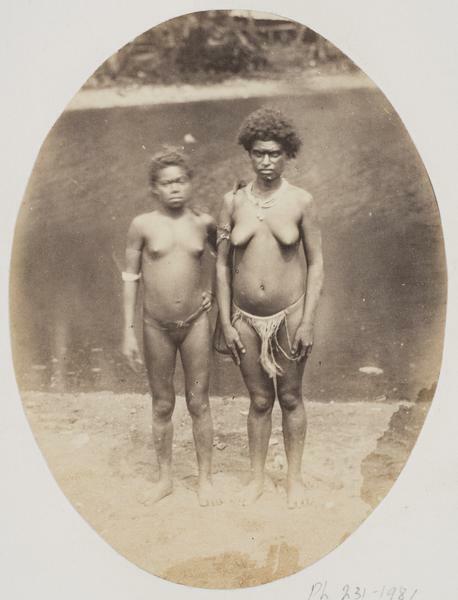 Photograph of two young girls, neither are wearing clothes. This photograph was taken c. 1865 by an unknown photographer, possibly on board the HMS Curacoa ship, based in Australia and surrounding countries and islands. The photograph is part of an album entitled "Views in the Australian Colonies: New Zealand and the South Sea Islands", which may have been compiled at a later date. Photograph of two young girls on Gulf Island. Taken c. 1865 by an unknown photographer.